A raw carrot a day keeps the toxins away. Root vegetables such as carrots protect themselves from bacteria and fungus in the soil by creating their own antifungal and germicidal agents. Raw carrots are a medicinal, healing food because the long carrot fibers attach to Endotoxins, bacteria and estrogens (that have been detoxed by the liver) and are removed through the colon in your stool. Does the carrot need to be raw? In order for carrot to work as an antibacterial food it must be raw. Cooking a carrot will break down its fibers and increase the levels of beta-carotene your body will absorb. 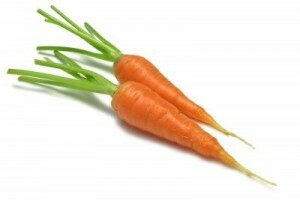 Juicing will remove all the protective fibers in the carrot and it will not detoxify the body. Juicing will also cause an increase in beta-carotene absorption. A healthy body with optimal thyroid function should have no issues converting beta-carotene to Vitamin A. In a hypo-metabolic state (suppressed metabolism or energy production), too much beta-carotene absorption can be toxic to the thyroid and can interfere with progesterone synthesis. When the body is not converting beta-carotene, it will be stored in tissues, leading to carotenemia (orange skin). This stored beta-carotene can actually interfere with Vitamin A conversion. Decreased levels of Vitamin A can lead to increased cholesterol, decreased bone formation, decreased immunity, and vision and skin issues.